Should We Be Busy For God? HomeBlogSpiritualityShould We Be Busy For God? One Sunday at church I passed our associate pastor as I scurried from one assignment to the next. “How are you?” he asked. Instead of lying with a socially acceptable response, I told him the truth. “Busy.” I sighed. As I scampered away he gave an approving nod with a knowing smile. “As long as you’re busy about the right things.” He even raised his eyebrows for emphasis. Even though I returned his nod and his smile, I knew he was wrong. I was too busy. This happened as a young twentysomething. A decade or so later, I hadn’t learned my lesson. Being between pastors, my church (a different one) needed me. In addition to volunteering for things that interested me, I also said “yes” to whatever it asked. I thought that being busy for God was my duty, a way to show him my love and devotion. At the height of my folly I served in ten roles. I was in several leadership positions, served on committees, and had a prime teaching assignment. These kept me busy on Sunday mornings and several evenings each week. I was the guy who made things happen. There wasn’t much that occurred there I didn’t know about. I wore my busyness as a badge of honor, and I shortchanged my family in the process. I was busy, too busy. Wisely I phased out of my responsibilities. I began to say “no” to new ones. At first I declined with a heap of guilt, but eventually “no” empowered me. I began to feel free. I spent more time with family – and with God. Now I have established some guidelines to keep me from overcommitment, three simple rules: Be involved in only one role at church. Volunteer for only one activity in my community. And no more than one evening away from home per week. I can’t find a single place in the Bible where God commands us to be busy for him. What he does want is for us to worship him, be in relationship with him, and put him first. But putting church first is not the same has making God first. God doesn’t reward us for our many church activities. Though the cause may be noble, the activity is misplaced. 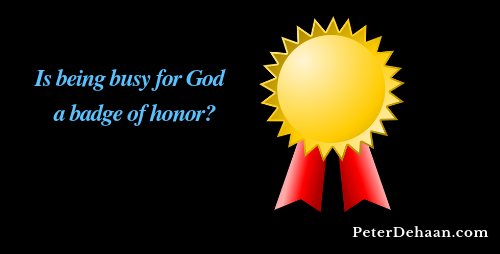 We honor God best when we put him first, not by being busy for him. I appreciate the truth in this, and also the authenticity with which you describe it. If more people were in tune to how God has gifted them and to how the Holy Spirit is leading them, servants who are better suited for a particular calling would find their way to the right positions. Not only does our busyness drag us down, it also deters others from stepping up. Indeed, Della, we need to listen to the Holy Spirit!